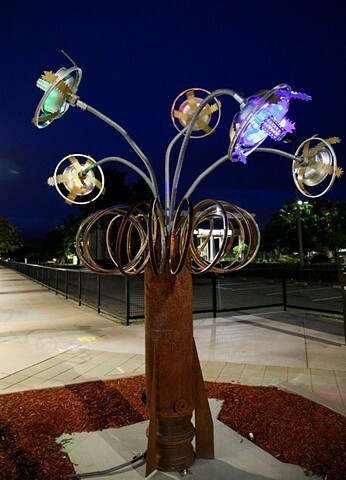 The mixed-metal sculpture “Space Glow,” by artists Patricia Vader and Joe Bologna is now on display at the corner of Fremont Boulevard and Capitol Avenue. It is the second piece of public art selected for display at that location as a part of the city’s rotational public art program. (Photo by Joseph Geha/The Argus). A 12-foot-tall sculpture that looks like a metallic bouquet of flowers by day and a glowing spaceship by night has been installed at the corner of Capitol Avenue and Fremont Boulevard in Fremont’s downtown. The sculpture, dubbed “Space Glow,” is the second piece of public art to be featured at that location. It replaces “Heartfullness,” a welded-steel sculpture shaped like a heart by Katy Boynton, and will be on display for two years. Made partly out of recycled aluminum and steel, “Space Glow” was created by artists Patricia Vader of Martinez and Joe Bologna of Alamo. In sunlight, the sculpture resembles a metallic bouquet with aluminum colanders, bike rims and stainless steel cutlery holders forming the body and flower petals. The petals are attached to flexible conduit stems mounted on a rusty water heater base with attached fins, which make it look like a rocket. At night the sculpture’s flowers glow in five LED colors, giving the work an otherworldly aura. “In our vision it was something that came flying in from outer space and kind of stationed itself,” Vader said in an interview last week. Vader said she and Bologna created the piece over the course of a few months in 2015 and previously displayed it at the Ruth Bancroft Garden in Walnut Creek. In its call for artists’ submissions last fall, the Fremont Art Review Board chose a theme of metamorphosis to represent the changes transforming downtown into a vibrant social gathering hub. Vader said she hopes people will see the sculpture as a playful piece of art. “With the lights on, those are quite spectacular at night because it glows in those aluminum colanders, so I hope it just gives them a little pang of joy in looking at it,” she said. “Space Glow” beat out 19 other art submissions, although another Vader work called “Butterfly” was picked as an alternate in case the Fremont City Council isn’t sold on it. Vader said she believes public art not only enhances a city’s physical space but also can serve as an economic driver by attracting residents and visitors. She added that such conspicuous installations can bring people closer to art in their daily lives. “It allows people to develop maybe a different way of looking at things, and enjoying them,” she said. The Art Review Board recommended “Space Glow” in December and the council approved it in January. The sculpture was installed May 25 by city workers and is to be unveiled 4:30 p.m. Friday.